R-7, a device shipping since November 2015, brings value to Fortune 500 companies and small enterprises alike. A productivity tool – it improves efficiencies and safety in a range of environments. Higher speed, fewer errors, greater flexibility and happier employees. You can purchase R-7 direct from MotionWerx! MotionWerx is an ODG R-7 sales partner. Let us craft an Augmented or Virtual solution for your industrial application with this top of the line untethered solution. We have bundled AR/ VR Solutions. Leverage our industry experience! The ODG R-7 is an excellent platform for your Remote Expert Solution! 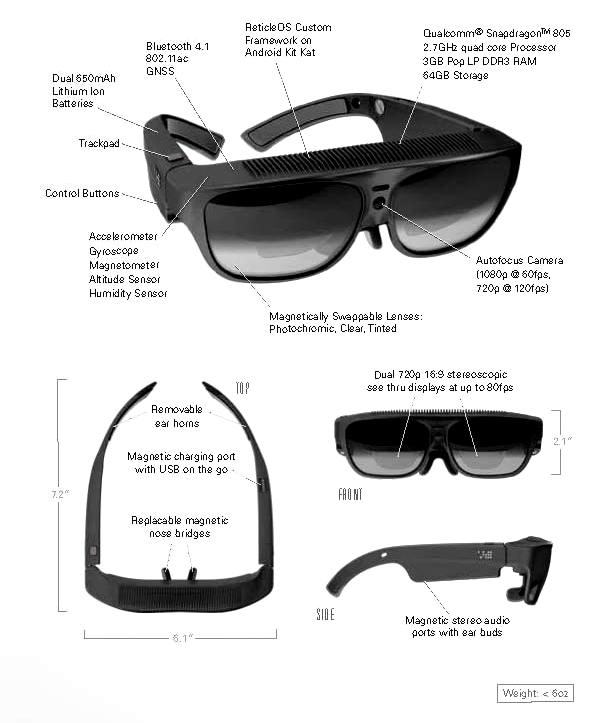 ODG recently unveiled their new R-8 and R-9 Smart Glasses at CES 2017 aimed at “light enterprise” and prosumer users for high-end smart glasses applications. Manufacturing, maintenance and construction professionals can quickly access checklists and work manuals. Pull up the exact design of an engine or building and follow step-by-step visual and audio instructions on how to build or repair it, while keeping hands free. Consult real-time with remote experts while showing live point-of-view camera and digital AR feed. Prevents and resolve project bottlenecks with Location Based Tracking. Keeps critical business and personal networks connected. Email. Browse the web. Navigate with GPS. Connect via social media. Place a video call. Play a game. Watch a 3D video. Read a book. Work on a report, a presentation, a spreadsheet. Endless possibilities anywhere, anytime, and in private. Record life’s best moments whether standing still or on-the-go – running, biking, skiing. Body position independent and able to work and play anywhere – lie down in bright sunlight and your screen will remain in your line of sight and fully visible. Medical professionals can view and share patient information and have mmediate visual access to monitoring devices, vitals, and medical records, while keeping an eye on the patient and keeping hands free. Live point-of-view camera feed delivers ability to communicate from across the operating room, care facility, country, or world. Reduces contamination with true hands-free capabilities. Soldiers and security agents such as border patrol officers can utilize biometric data capture capabilities to increase awareness and effectiveness. Camera provides live feed to others on the ground or back at base, improving coordination or providing an accurate log of activity. Rapid delivery of useful contextual information, such as environmental information and suspects whereabouts in relation to location. Workers at energy plants often service equipment in dangerous and noisy environments. Access information and interact with it while keeping hands free to complete a task quickly, effectively, and safely. Allows technicians to better understand, see, and complete the task at hand and ensures proper technique and best practices. Professionals in warehouses are able to view an optimized and streamlined workflow to guide them through their packing lists and with real time inventory management. AR allows for quick and easy part identification and hands free barcode scanning. Reduces downtime penalties and errors – increases productivity, accountability, and accuracy and improves the financial efficiency of day-to-day operations.